Lacy “Larry” McGraw , 84, of Cornelius, NC went home to be with the Lord on October 14, 2017. He was born on January 19, 1933 in Charlotte to Fred and Beatrice McGraw but was raised by his aunt and uncle Mary and Earl Polk. Larry was a Korean War veteran, serving in the U.S. Navy. 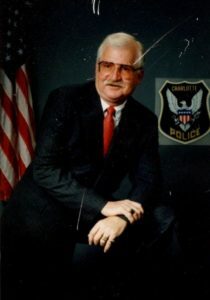 He joined the Charlotte Police Department in 1957 and served for 30 years, retiring in 1987. Larry graduated from the FBI Academy in Virginia. He was a member of Prichard Memorial Baptist Church for 20 years before joining Lake Norman Baptist Church where he enjoyed preparing Wednesday night suppers for 13 years. He was most recently a member of the Neighborhood Church. He loved serving others and served meals to people at Bryan Center who could not feed themselves. He would wear his cooking hats and jackets just to make the patients laugh. Larry loved playing golf and won a BMW for hitting a hole-in-one in 1993. Larry is survived by his wife of 63 years, Joan Smith McGraw; sons, Larry Alan McGraw and David E. McGraw; grandsons, Larry Alan McGraw, Jr. and Eric Blain McGraw. His is survived by a sister Lynda Smith and preceded in death by one brother. He has four great grandchildren, one of whom is named after him, Layci McGraw. A funeral service will be held on Wednesday October 18, 2017 at 2:00 pm at the Raymer-Kepner Funeral Home with Rev. Landon Horton officiating. The family will receive friends one hour prior to the service. Interment will follow at Sharon Memorial Park. In lieu of flowers, memorial may be made to the Neighorhood Church, 12625 Kemerton Lane, Huntersville, NC 28078. Friends may offer condolences to the family at www.raymerfh.com.